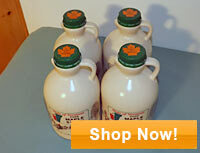 This one pint portion of pure Vermont maple syrup is the perfect size for yourself or as a gift. Make sure you try all of our grades. A great size for your entire family. 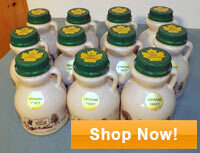 Choose this size when you've found your favorite flavor of our pure Vermont maple syrup and want to make it last. 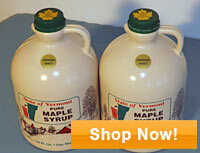 An economical 64 ounces of the best tasting pure Vermont maple syrup you'll ever enjoy. A half gallon is perfect for the restaurant or service industry looking to make guests very happy. 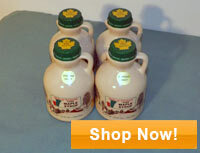 Once you've tasted our products, this one gallon jug is what you will buy from now on! Actually, it's a great size for professional applications that want an economical way to offer the best tasting pure Vermont maple syrup to the customers they love. Sized perfectly for the restaurant or service industry, this half pint size (8 fluid ounces) is the perfect portion to satisfy your guests. Just enough to meet their needs with an incredible taste to complement your breakfast offerings! 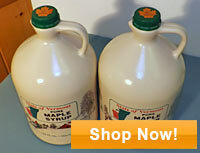 This is fresh and pure Vermont maple syrup here...the real thing!